Just as you can filter an Excel 2010 pivot table to display a subset of data, you also can filter a pivot chart so that it shows just the information you want it to show. When you graph the data in an pivot table using a typical chart type, such as column, bar, or line that uses both an x- and y-axis, the Row Labels in the pivot table appear along the x- or category-axis at the bottom of the chart, and the Column Labels in the pivot table become the data series that are delineated in the chart’s legend. The numbers in the Values field are represented on the y- or value-axis that goes up the left side of the chart. You can use the drop-down buttons that appear after the Report Filter, Legend fields, Axis fields, and Values field within the pivot chart to filter the charted data like you do the values in the pivot table. As with the pivot table, remove the check mark from the (Select All) or (All) option and then add a check mark to each of the fields you still want represented in the filtered pivot chart. Axis Fields (Categories) to filter the categories that are charted along the x-axis at the bottom of the chart. Legend Fields (Series) to filter the data series shown in columns, bars, or lines in the chart plot area and identified by the chart legend. Report Filter to filter the data charted along the y-axis on the left side of the chart. Values to filter the values represented in the pivot chart. 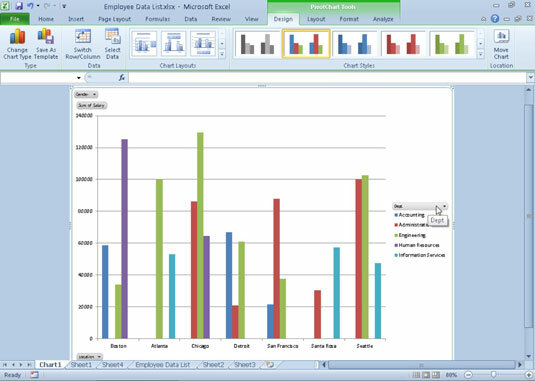 Click a drop-down button within a pivot chart to filter the data displayed in the chart.